Even in today’s rapidly evolving world of technology, there are few things that make your jaw drop when you see them in real life. Honda’s ASIMO is one of those things. When you witness this bipedal humanoid robot hopping in a circle on one foot, taking a few steps back to line up a kick to a soccer ball, or transitioning smoothly from a walk to a slow jog, you have to remind yourself that you’re not looking at a person in a robot suit or some sort of computer-generated special effect. This is an autonomous mechanical being, capable of walking around on two legs and making its own decisions based on input from its sensors. Its name, an acronym that stands for “Advanced Step In Innovative Mobility,” appropriately evokes Isaac Asimov. The version of ASIMO shown off for the first time in North America this week isn’t brand new, but it is the latest public version of Honda’s robot. “Version 3” was first unveiled in 2011, but like other forms of technology, Japan got to see it first. Compared to “Version 2,” the newest ASIMO has a few new tricks: A faster running speed of 5.5mph, greater dexterity in its fingers, the ability to climb and descend staircases more smoothly, and the ability to hop up and down — on one foot, even. It’s the result of 28 years of bipedal robotic development at Honda, with the first “ASIMO” branded robot introduced in 2000. ASIMO Version 4 is in the very early development stages in Japan; Honda was not able to comment on the new features built into that robot. When ASIMO is walking around, it sounds a bit like a dot-matrix printer. Through an interpreter, Honda Senior Chief Executive Engineer and ASIMO Project Leader Satoshi Shigemi says that whirring hum is due to its network of internal motors which give the robot its 57 degrees of freedom, as well as an air-cooling system to keep its CPUs from overheating. ASIMO has sensors everywhere: Force sensors in its fingers to make sure it’s not crushing things, sensors in its waist that help it climb up and down stairs, image sensors in its eyeballs help it gauge its environment and make decisions. It takes a lot of battery power to drive this complex humanoid: A 13-pound lithium-ion cell that takes three hours to charge. That battery is stashed in ASIMO’s “backpack,” and it can power about 40 minutes of continuous walking, according to Shigemi. When ASIMO senses it’s running low, it automatically seeks out its charging station and plugs itself in. But even when ASIMO is still and silent, its “muscles” are constantly working. While briefing members of the press on how to properly shake ASIMO’s hand, Honda Assistant VP of North American Corporate Affairs Jeffrey Smith said that ASIMO’s still waters run deep. Two sides of uncanny valley crash into each other when it comes to ASIMO; despite its unmistakably human qualities, it’s also robot-like enough to prevent feelings of discomfort. On one hand, the robot’s physical movements and finger dexterity, which allow it to communicate in both American and Japanese sign language, are eerily human. But due to a combination of ASIMO’s abstract facial features, smallish stature, and childlike synthesized voice (it was created using the recorded voice of a 16-year-old boy), watching and interacting with the robot doesn’t feel too creepy. Honda refers to the robot as “ASIMO” or “it,” refraining to assign it a gender identity. It seems a bit cold given ASIMO’s human-ness, but it also helps reinforce the fact that this is a human-like machine, not a machine-like human. ASIMO does indeed have a “face” when you peer through its dark-tinted shield; its large video-camera eyes and smiling “mouth” look more like a friendly, smiling emoticon than a real human visage. 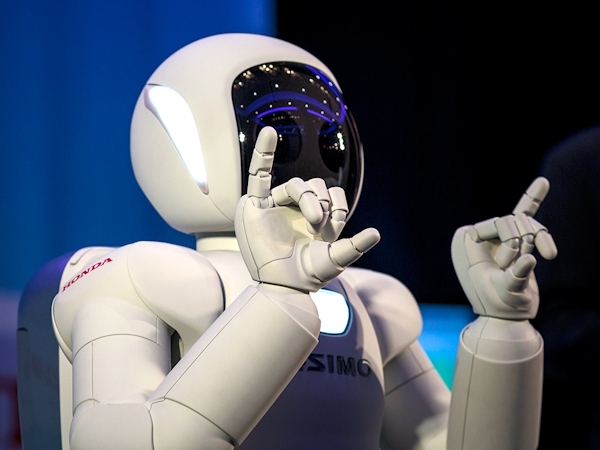 “We’ve seen, particularly with children — they look into ASIMO’s face and they smile. That’s very intentional on our part,” says Honda’s Smith. Its walking posture is also as mildly amusing as it is impressive, as it scoots around in a slightly crouched stance akin to a tiny running back with an accident in its pants. The fact that ASIMO clocks in at 4’3” and 110 pounds also prevents it from seeming intimidating. There’s also a practical reason behind its slight stature. Ultimately, ASIMO is being developed with these kind of situations in mind. Honda says its “dream” is that one day, humanoid robots will be able to assist and care for the elderly, help perform chores around the house, and provide assistance to people in public places such as airports and train stations. Honda Robotics has two other products in development: a Walking Assist built to help people with leg injuries, and the UNI-CUB personal mobility device. In ASIMO’s case, there are obstacles to overcome on both the human and the robot sides of the equation. While humanoid robots may one day seem as mundane and commonplace as smartphones, we’re certainly not there yet; it’s one thing to watch ASIMO do its thing on stage at a demo, but feeling comfortable enough to have a full-time robotic roommate is another story altogether. According to Honda, ASIMO is still “at least a decade away from use in care facilities,” and ongoing tests in Japan will help develop the most-important traits for that scenario. But just as humans will need to get used to ASIMO, ASIMO will need to get used to interacting with us. Because human behavior is so unpredictable and nuanced, something as “basic” as being in a public place is a significant challenge for the development team. The next major step in ASIMO’s evolution will likely involve focusing the robot’s capabilities rather than expanding what it can do. And just in case you were interested in developing your own apps and use cases for ASIMO, you’re out of luck for quite some time.